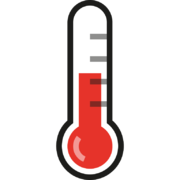 Check temperature of Raspberry Pi CPU | Michael Hirsch, Ph.D.
A light-moderate use Raspberry Pi 2 in an office environment measures in the 40 - 45 ℃ range (no fan, small heatsink, with case). 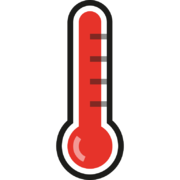 A red thermometer icon superimposed on the Raspberry Pi display output means the Raspberry Pi is overheating and is throttling the CPU and GPU to avoid self-destruction. You can use crontab -e for setting a schedule to periodically log temperature and CPU frequency.